“Autologous mesenchymal stem cells” are derived from your horse’s bone marrow, which we will have collected 2-4 weeks prior (see “Collecting bone marrow for stem cell therapy”). Stem cells occur naturally in the body and have the unique capacity to renew themselves and be programmed into specialized cell types, allowing an injured horse to naturally regenerate tissue that has been damaged. From your horse’s bone marrow, a regenerative medicine laboratory cultures large concentrations of stem cells to be injected into the injured area for more organized healing, with less fibrosis and scarring of the originally damaged tissue. Research has shown that stem cells not only regenerate tissue, but also recruit growth factors and augment chemical messenger signaling of the body’s own tissues. Although there is still have a lot to learn and understand about stem cells, we do feel that they are efficacious in improving the quality of healing of tendon and ligament injuries. 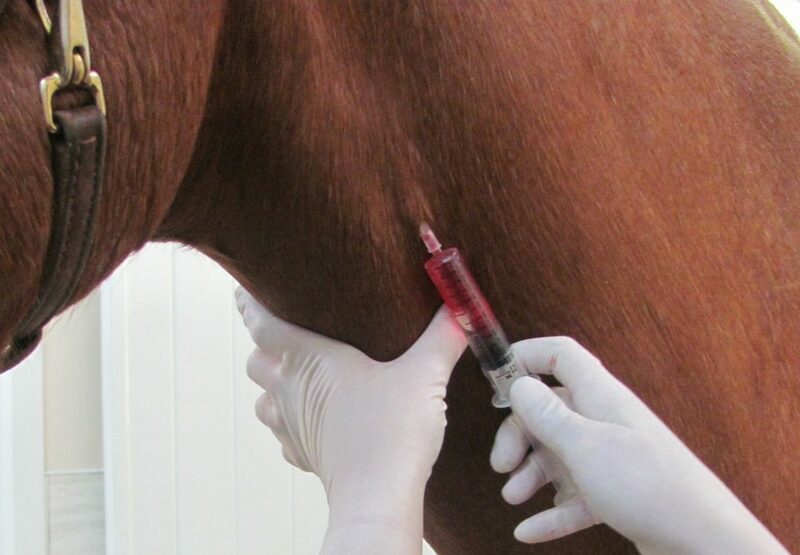 Just as with a bone marrow harvest, stem cell injections are typically an “outpatient procedure” meaning you can haul your horse to the clinic, have the injection performed and take your horse back home within the same afternoon. You should plan to be at the clinic for about two hours (a bit less or more depending on the case). Once your horse has had some time to settle into the stall and get a drink of water, we will give him or her a light dose of sedation and walk to the exam room in the main building. You are welcome to come along and watch the procedure! Depending on the nature of the injury, the doctor may ultrasound your horse’s leg before injecting stem cells to assess progress and pinpoint the exact location of the lesion, ensuring the stem cells will be delivered to the area (or areas) that need them the most. We then clip and thoroughly scrub the area where the doctor will inject the stem cells. The doctor may choose to perform a regional nerve block proximal to the injured area so that your horse does not experience any discomfort when the needle (or needles) are placed into the lesion for injection of stem cells. By “numbing” that part of the leg, we also decrease the likelihood of leg movement during the procedure, which could result in loss of some stem cells. Next, the doctor uses ultrasound guidance to place a needle (or several needles) into the lesion. and carefully injects the stem cells. 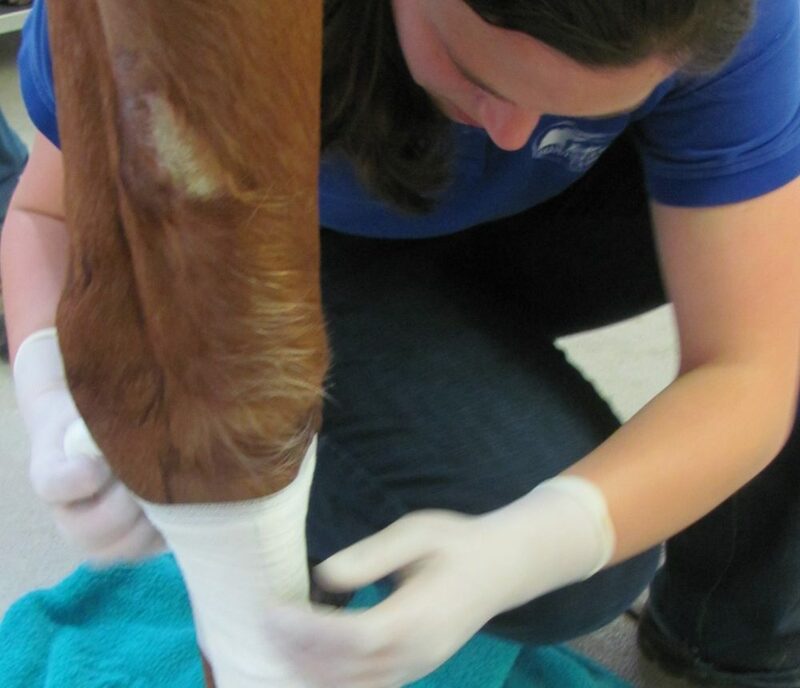 A protective bandage is placed on the limb an your horse is given a dose of anti-inflammatory medication. After this, your horse can go back to a stall to relax while the sedation wears off, and they are usually ready to trailer about 30 minutes later. The doctor will review the physical rehabilitation plan with you and make any alterations to it, if needed. Bone marrow harvests are typically an “outpatient procedure” meaning you can haul your horse in to the clinic, have the harvest performed and take your horse back home within the same afternoon. You should plan to be at the clinic for about two hours (a bit less or more depending on the case). Once your horse has had a some time to settle into his stall, get a drink of water, etc. (we know it is a long haul for some of our patients!) we will give him or her a light dose of sedation and walk to the exam room in the main building. You are welcome to come along and watch the procedure! Next, a small patch on your horse’s sternum will be clipped and cleaned. (Occasionally an alternate site such as the Tuber coxae is used). 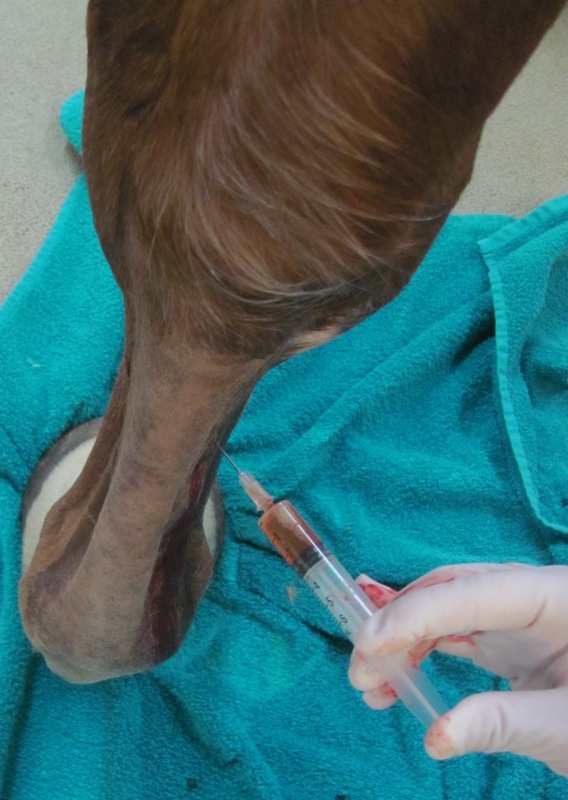 After that, a local anesthetic will be injected into the skin over the site where the bone marrow needle will be placed, minimizing any discomfort to your horse. Then the area is scrubbed again to ensure that no bacteria are introduced when the bone marrow needle enters the sternum through the skin. After the site has been adequately prepped, the needle is carefully advanced through the skin, subcutaneous layers, external boney part of the sternum, and into the bone marrow. This part of the procedure requires a lot of experience, skill, precision, and patience on the doctor’s part. 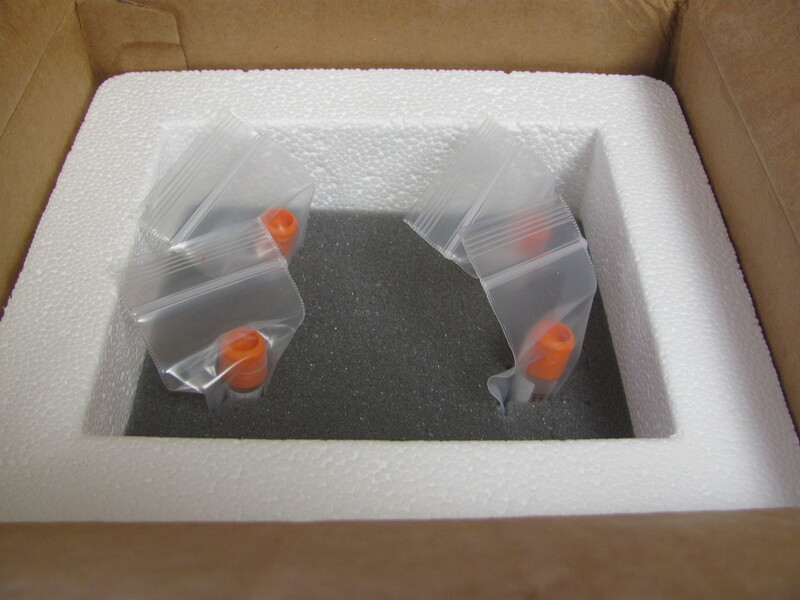 Then, with any luck, bone marrow is aspirated in adequate volumes, placed into appropriate vials, and processed for shipment to the regenerative medicine laboratory. We will make sure that your horse receives an appropriate anti-inflammatory to ease any discomfort of inflammation from the harvest procedure. After this, your horse can go back to a stall to relax while the sedation wears off, and they are usually ready to trailer about 30 minutes later. The laboratory requires about 2-4 weeks to process and culture “Autologous mesenchymal stem cells”, and they will contact our clinic when the cells are ready so that we can arrange a time that works for you to bring your horse back for their treatment. Wonder if stem cell therapy is an option for your horse? We’re happy to answer your questions. Does your horse have stomach ulcers? Is he crabby, girthy, or bucking after fences? Has he been colicking, losing weight, or refusing to eat his grain? Maybe his haircoat is poor, or he has lost impulsion. Or perhaps, he appears to be in perfect health. Any and all of these issues can be due to ulcers in a horse’s stomach, and a large percentage of horses (especially those who perform as athletes) have ulcers. This is not surprising when the fact that nearly everything we ask horses to do (stand in stalls, eat grain, be ridden, ride on a trailer, spend periods of the day not eating, etc. etc.) is a challenge to their normal digestive physiology, which evolved to support a constantly grazing animal that walks a lot and very occasionally runs very fast for a short period of time. It is hard to know if the problems listed above are caused by ulcers in a horse, because they all have lots of other causes, too. The only way to know for sure if a horse has ulcers is to perform a gastroscopy (endoscopic examination of the stomach), which allows visual inspection of the entire stomach. This requires the stomach to be empty, and provides information about the presence, location, and severity of ulcers in the horse. It can also reveal other causes of stomach problems and provide a base line image to which later exams can be compared for monitoring. 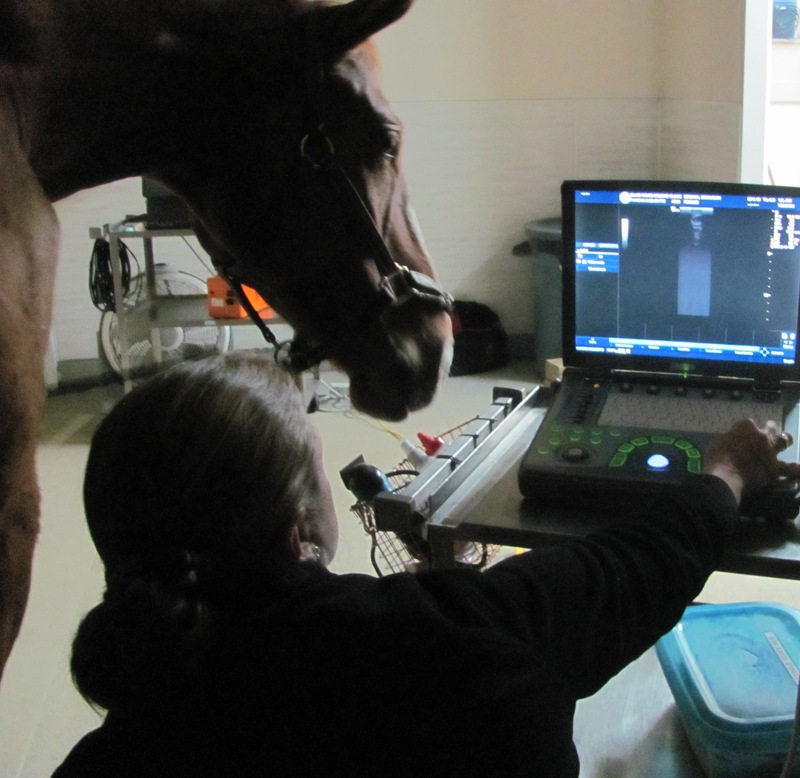 Gastroscopy is well tolerated by horses and requires only moderate sedation to be performed. The biggest advantage of performing the scope, rather than just treating a horse, is that it confirms the presence or absence of ulcers and helps to guide treatment, whereas using response to treatment as a diagnostic tool can be misleading. Some ulcers may not respond to a standard dose of medication in the first weeks of treatment, so a medication trial abandoned after 7-10 days may give the false impression that ulcers are not the culprit. Also, severe ulcers may benefit from a combination of treatments. Treatment of gastric ulcers in horses is pretty straightforward in most cases and involves suppressing the production of acid in the stomach. The drug omeprazole is the most effective drug for this in the horse, and is available in an FDA approved paste called GastroGard®. This product uses a patented technology to deliver the drug in enteric-coated microbeads, which protect the drug from neutralization in the stomach acid. Compounded (“generic”) omeprazole products have been demonstrated to be ineffective because of the effect of the gastric environment on the drug. Ranitidine is a medication that can also reduce the amount of acid in the stomach, but must be administered every 8 hours to have effect. For very severe, painful ulcers, a drug called sucralfate can be added to coat the ulcers and protect them and speed healing. Avoiding ulcers can involve the use of medications and supplements (UlcerGard®is the FDA approved product for this purpose, and is omeprazole given at a lower dose than for treatment), but be aware! Most of the products for sale to the horse owner have not been evaluated critically for efficacy, and may not be helpful. Management changes that can benefit ulcer prone horses include feeding alfalfa hay at the time of a grain meal, feeding smaller meals more frequently, giving the horse as much access to pasture turn out as possible, having forage available free choice, and sticking to a predictable routine. We offer multiple regenerative medicine products to help your horse heal better. Please contact your veterinarian for pricing and to discuss which product is best for your horse. Pro-Stride is a combination of IRAP and PRP in a single product. Pro-Stride is prepared from autologous whole blood which can be processed horse side in about 20 minutes using a special portable centrifuge. Pro-Stride is injected intra-articular (into the joint). It has been reported to reduce pain associated with arthritis and deliver anti-inflammatory proteins to the site of injury. 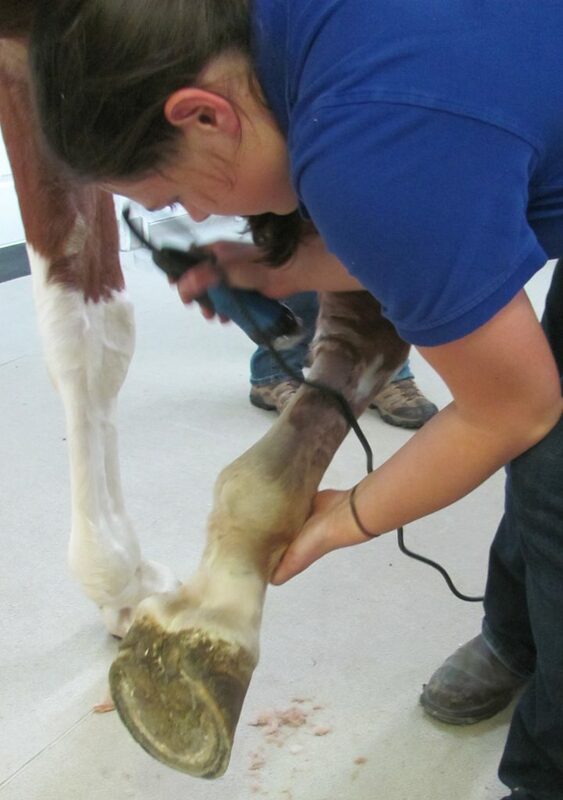 In one study, Pro-Stride was shown to provide pain relief for up to one year (A. Bertone, Am J Vet Res 2014; 75:141-151). Have you ever noticed a substantial range in the cost for hock injections performed by different veterinarians? Ever wondered why that is? Not all “hock injections” are the same, so when your horse is having its hock injected, it helps to be educated on which joints are being injected and with what substance they are being injected. Prices for hock injections may vary depending on what medications are being injected and how many joints are being injected. The “hock joint” in the horse is actually comprised of several separate joint spaces –with long medical names – but for ease, most vets refer to them for injection purposes as the lower, middle and upper hock joints. In regards to the upper hock joint, it is the one responsible for most of the motion of the hock joint, so when the hock bends, this is the joint that makes that happen. It is pretty uncommon for show horses to have primary upper hock issues, but it can happen. OCD of the upper hock joint can also be a significant issue in young horses just starting into work, often presenting as a very swollen hock. OCD’s should be evaluated for possible surgical removal, and upper hock joint injections can be done to keep the horse comfortable and reduce swelling. 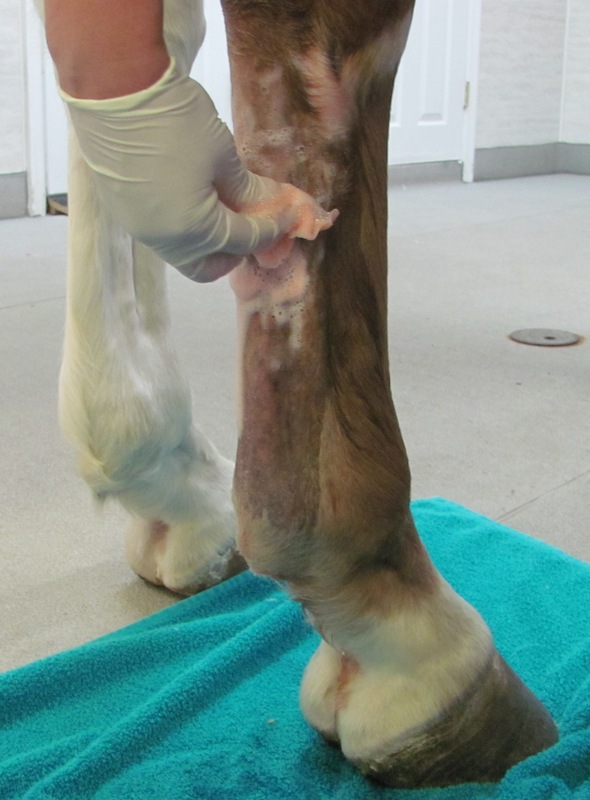 In most show horses, the most common place that is injected are the lower and middle hock joints. The lower and middle hock joints are two very low motion joint spaces. Basically, they are comprised of several tarsal (hock) bones that are stacked one on top of the other like blocks. These bones have some cartilage between them and synovial joint capsule surrounding them. While they are technically joint spaces, they only comprise a small amount of the motion of the entire hock joint and are considered low motion joints. Basically, they have just enough cartilage and joint fluid to slide around on top of each other a little bit as the horse puts its foot on the ground. With horses in work, these lower and middle hock joints undergo a huge amount of stress and strain every time the horse puts its hind leg on the ground. Genetics (including conformation and breed), along with the stresses/forces we put on our horses when we do things such as ask them to rock back on their hind end, make those tarsal bones twist, slide and grind over each other. Cartilage is the cushioning between the bones. When a horse starts to have thinning and degeneration of the cartilage in the lower and middle joint spaces, pain is often the result because there is bone grinding on bone. Horses will also start to form bone spurs along the edges of the bones that are evident on radiographs. This is the beginning of the fusion process in the lower and middle hock joints. To help relieve pain during the degeneration process, injection of the lower and middle joint spaces is often done. Often trying to encourage the fusion process in the lower and middle hock joints is a good thing, because if we can get them to fuse, they don’t slide, and therefore they don’t hurt anymore. There are different combinations of medicines to use in joint injections. In a young horse with hock pain that has minimal changes on xrays, we may use a HA product (hyaluronic acid-both a lubricant and anti-inflammatory) possibly combined with triamcinalone (kenalog) which is more cartilage-preserving than the other steroid choices. If a horse is older and already showing signs of the fusion process beginning, we may use methyprednisolone only (Depo-medrol-another steroid). Depo is a great drug for these types of joints because it has longer acting pain killing properties and it is thought to speed up the cartilage degradation process and may help speed up the fusion process. Again, different veterinarians may have different medication preferences depending on the horse’s age or amount of radiographic changes in the hock. While steroids +/- hyaluronic acid are most commonly injected into the hock joint, other options include IRAP and intra-articular adequan. Lastly, horses that are not helped by the steroid injections or helped only for a short period of time with injections, may be helped with ethyl alcohol injections in fusing lower and middle hock joints. This is a relatively new procedure that is being done, and must be done after xrays and appropriate contrast dye studies of the lower and/or middle hock joints are done, proving that the joint spaces are not connected to the upper (high motion) joint. In a small percentage of horses there may be communicating joint spaces – so while getting a little steroid in the upper joint during a routine steroid or HA injection is not a problem, getting alcohol in that joint space would be devastating and possibly life ending for the horse. The ethyl alcohol works in two ways. It has both a pain-killing property which can make the horse more comfortable, and it can also chemically speed up the fusion process. 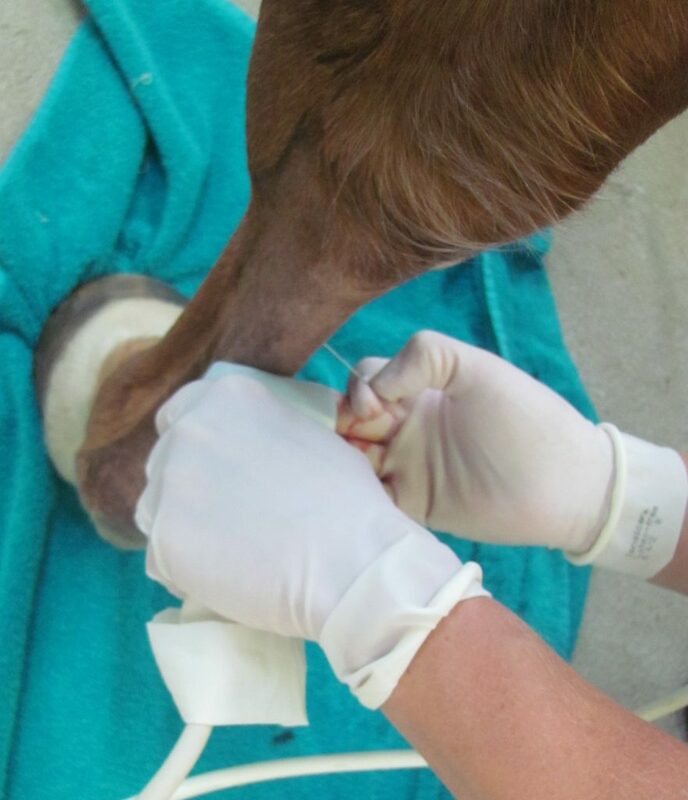 More and more veterinarians are becoming familiar with and are performing or referring out for this procedure. If your horse is getting its hocks injected, discuss with your veterinarian the different options to help choose the best treatment for your horse. 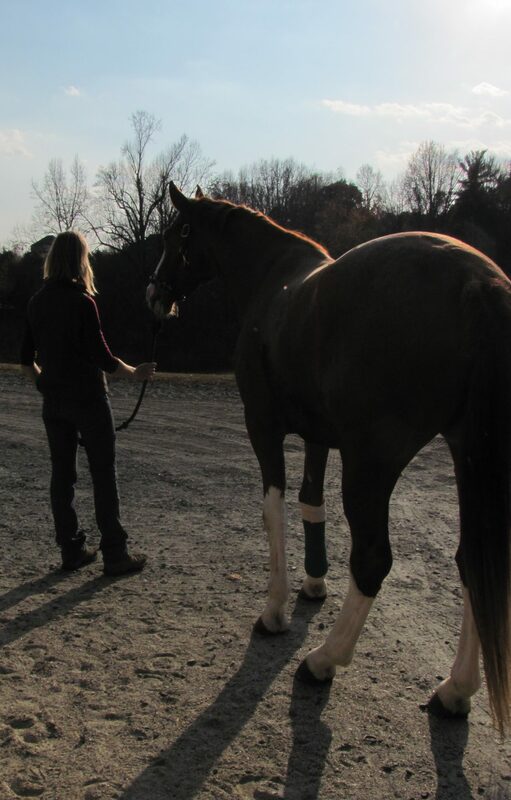 http://blueridgeequine.com/wp-content/uploads/2014/02/RC-purchase-exam-e1531773353828.jpg 1850 1233 Dr. Julia Hecking, DVM, CVA http://www.blueridgeequine.com/wp-content/uploads/2012/10/logo.png Dr. Julia Hecking, DVM, CVA2015-01-21 14:36:032018-07-16 16:36:29How Much Do Hock Injections Cost For A Horse? Tildren and Osphos are now FDA approved and available in the US. Previously Tildren was available in the US, but because it was not FDA approved or manufactured in the US it had to be shipped in from France, requiring quite a lot of paperwork. Both drugs belong to a group of drugs called bisphosphonates which are used to treat osteoporosis in humans. In clinical trains performed by Dechra, the drug company that manufactures Osphos, the drug helped horses improve 1 grade of lameness in 75% of cases. Osphos, which is very similar to Tildren, works by inhibiting bone resorption by binding calcium phosphate crystals, thus reducing bone pain. Clinical improvement is typically most evident at 2 months after this first injection and 65% maintained their level of improvement for 6 months. Further injections can be administered as needed to help maintain improvement. While the drug has been approved based on the navicular syndrome model, other types of bone related pain may benefit from this drug as well. Osphos is a much less expensive option than Tildren and can be done in 1 visit with an intramuscular injection. Navicular disease is a syndrome, which means it can have many different causes including bony issues, soft tissue issues (including tendons, ligaments, and the navicular bursa) or a combination of both. Because of the many causes of navicular syndrome, these drugs may not help every case of navicular disease. Call your veterinarian to discuss if your horse is a candidate. http://blueridgeequine.com/wp-content/uploads/2013/05/images-DR.jpg 459 606 Dr. Julia Hecking, DVM, CVA http://www.blueridgeequine.com/wp-content/uploads/2012/10/logo.png Dr. Julia Hecking, DVM, CVA2015-01-20 09:09:342018-07-20 20:02:52Osphos And Tildren Are Now FDA Approved And Available In The U.S. Thank you to Deb and Mark Burke, owners of Amethyst Acres Equine Center, Inc. in Buchanan for inviting Drs. Julia Hecking and Tabby Moore to speak at their Alternative Therapies for Horses learning day on November 8. The doctors very much enjoyed a day of learning and fellowship with horse enthusiasts from Southwest Virginia. Dr. Hecking is certified in equine acupuncture by the Chi Institute in Florida. She gave a PowerPoint presentation, answered questions and explained how successful acupuncture can be for treating painful and/or stressed horses, before demonstrating on the lovely Shady Lady. Dr. Moore is certified by the American Veterinary Chiropractic Association and gave a presentation on the benefits and uses of equine chiropractic therapy. She demonstrated an adjustment on Shady Lady, who was no doubt feeling relaxed, loose and thoroughly pampered after serving as the equine volunteer for the day. In fact, Deb shared that when she was turned out the next morning, the 28 year old mare took off running and bucking – a true testimony to the effectiveness of these therapies, according to Deb. We appreciate the Burkes dedication to educating horse lovers on best practices in equine care and for inviting our doctors to be a part of this great learning experience.